These eight ingredient Slow Cooker Sausage and Sauerkraut Sandwiches are the most hands off game day recipe ever. 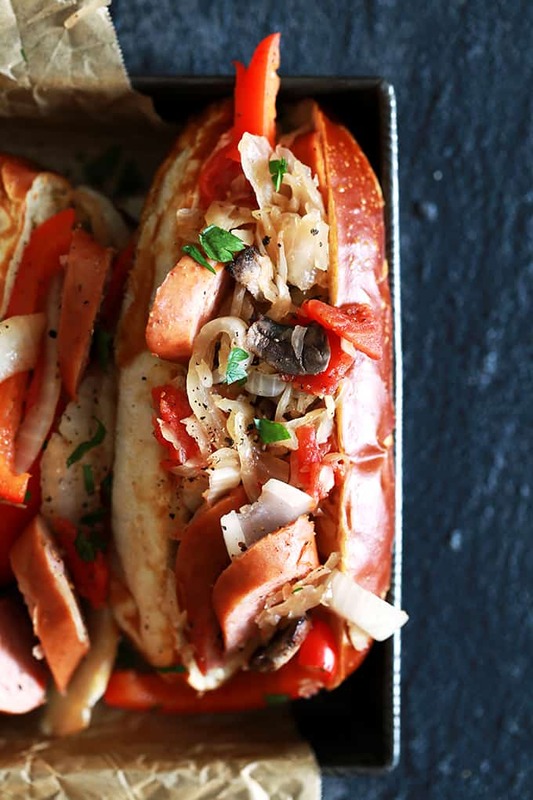 Smoked sausage, sauerkraut, onion, red bell pepper and mushrooms are slow cooked to perfection before being stuffed into a sandwich roll. It’s that time of year when I realize that our alma mater’s football team is really just out to cause me stress and heartache and the professional team we root for is doing the same thing. But yes, we will continue to watch each and every game. To make game day a little bit more enjoyable, I’m all about the game day food spread. These Slow Cooker Sausage and Sauerkraut Sandwiches couldn’t be more perfect and are a definite crowd pleaser. These eight ingredient – including the roll! 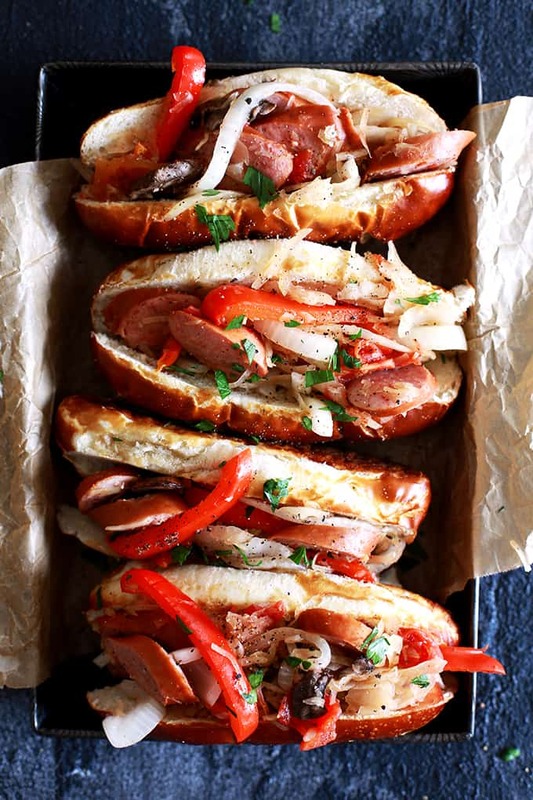 – Slow Cooker Sausage and Sauerkraut Sandwiches are the most hands off game day recipe ever. 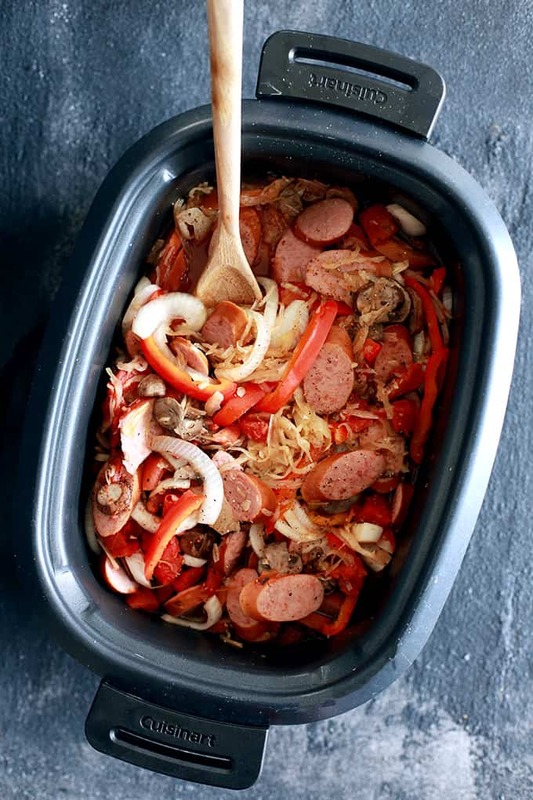 Smoked sausage, sauerkraut, onion, red bell pepper and mushrooms are stirred together with brown sugar, pepper and garlic and slow cooked before being stuffed into a sandwich roll. In short, these sandwiches are what my husband would pick for his last meal on earth, if given the opportunity. I’m thinking you’d have quite the spread if you served them with my Oven Baked Pickle Chips with Horseradish Chipotle Sauce and Creamy Baked Double Cheese and Spinach Dip. You probably should go with my Yogurt Dill Vegetable Dip as well. You know, for a healthy-ish option as well. Unlike similar sandwiches you may have had in the past, these aren’t soggy! There’s nothing worse in my opinion than a soggy sandwich where the bread or roll soaks up all the liquid and immediately begins to fall apart. Plus, don’t get me started on the texture of a saturated sandwich. So gross! Instead, all of the liquid is drained from each ingredient before being put in the slow cooker and then they’re cooked just enough so that the vegetables remain crisp tender and don’t turn to mush. Don’t get me wrong, if you’re into that whole aus jus situation there is some cooking liquid leftover for sandwich dipping. I’ll gladly let you have it all to yourself. 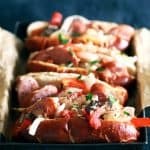 Of course, any sandwich roll or bun would work for these Slow Cooker Sausage and Sauerkraut Sandwiches but I have to tell you that a pretzel roll will really make them disappear quickly. The light and airy texture paired with the hearty sandwich filling is a winning combination. I guess that makes the fact that my team won’t be pulling off a win anytime soon a bit more bearable. These eight ingredient Slow Cooker Sausage and Sauerkraut Sandwiches are the most hands off game day recipe ever. 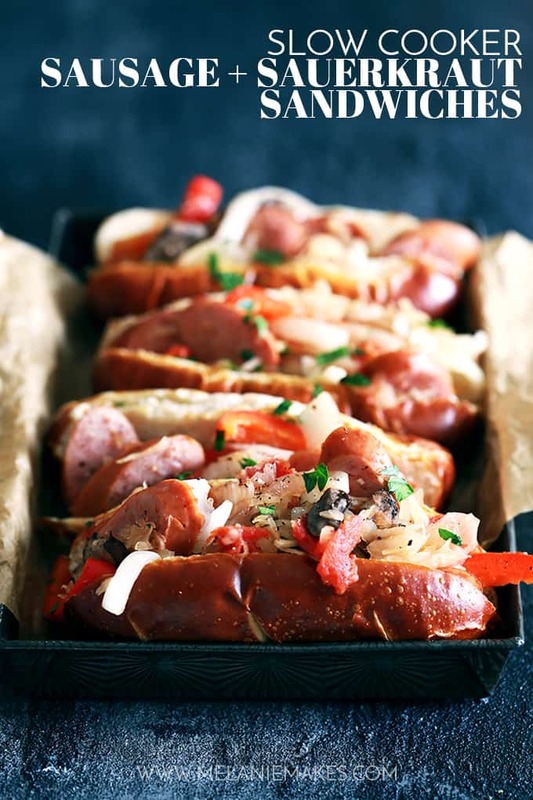 Smoked sausage, sauerkraut, onion, red bell pepper and mushrooms are stirred together with brown sugar, pepper and garlic and slow cooked to perfection before being stuffed into a sandwich roll. In a six quart slow cooker, add sausage, tomatoes, sauerkraut, mushrooms, bell peppers, onion, brown sugar, pepper and garlic. Gently stir together. Cook on HIGH two hours or on LOW four hours. Stir together and taste for seasoning. Depending on the brand of tomatoes used, you may want to add a bit of salt to the sausage mixture prior to serving. I used store bought sauerkraut in this recipe, but you definitely could learn How to Make Sauerkraut and substitute it here. It would also work well for these Sauerkraut and Kielbasa Nachos with Cracked Pepper-Dijon Cream or these Polish Hush Puppies, both of which would be perfect for game day as well. I love making these for parties, because the slow cooker takes all the work out of it! Everyone always asks me for this recipe! Thank you! Thrilled you love them, Allyson! Yum! Love the flavor in these! Perfect for game day! oh my, hubby will love me forever and I just happen to have everything on hand! Dinner just got so easy, Chrissie! I am definitely craving these sandwiches! These are so perfect for quick lunches! Absolutely a great lunch idea, Abeer! These sandwiches look good! I will try this for lunch tomorrow! Your party will be a hit with these sandwiches! They are fully loaded and sure to disappear quickly! Any excuse to use my slow cooker to make dinner time easier is a winner to me! This looks so delicious! Looks great, but you mention bell pepper , but it doesn't seem to be in the recipe? This is my kind of food! Sounds amazing. I'm loving these sandwiches and that jazzed up sauerkraut! Perfect for dinner or game days!! What a great game day option! Love that it's in the slow cooker too! This is exactly the kind of loaded sandwich my husband loves! I can't wait to make these for him! Definitely husband approved at our house, Sabrina! Wow, this actually looks stinking incredible. Like, might change my weeknight plans for this one kind of incredible. Thank you SO much for sharing! Such an awesome compliment, Karly - thank you! This is perfect game day food! It's sure to be a big hit! I am loving that the slow cooker is doing all of the work. Perfect game day treat! Does the sausage need to be browned first to render off some of the fat? 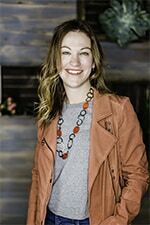 Just thinking if not will be grease from the sausage make everything in the crockpot greasy and soggy? Thank you! Sounds great. Think I might make as sliders! Hi, Cindy - No need to brown! There isn't any fat at the bottom of the crockpot, rather just some liquid from cooking the veggies. Love your idea of making them sliders! For some reason those rolls look sooooo good to me! Totally craving carbs! Can't wait to try this recipe out!